In the immediate aftermath of the Solyndra bankruptcy, I had the sense that nuclear proponents saw the disaster in the solar industry as a vindication of the nuclear industry. Not so fast! The fact that one solar project tanked is not going to convince die-hard fans of renewables that anything is wrong with renewable projects, and it is certainly not going to cause a rush to the nuclear side. There will be reasons cited by solar proponents (there already are) why this is an exception, one small blip in an otherwise sterling record. And maybe it is an exception. I actually hope it is, because the other possible trend I see emerging from this meltdown is that is will give a black eye to all loan guarantees. Particularly in the current budget environment, where everyone is looking for easy places to cut, it will be very tempting to put loan guarantees on the budgetary chopping block. If a nice, safe solar project went bust, some may say, a big, complex nuclear project may be even more risky. I am already seeing some possible fallout from the Solyndra failure. Although Sen. Lisa Murkowski is a supporter of loan guarantees (as well as a supporter of both the nuclear and renewable industries), she has reportedly told the renewable industry to expect greatly restricted federal funding. It's not clear just how much of this restriction is a consequence of the bankruptcy and how much is a general consequence of the budget discussions, but I think it will be difficult for Congress to cut loan guarantees for one industry without also cutting others. She is recommending to the renewable energy industry that they and other industry sectors work together to form a broad coalition. While it is too soon to panic, the nuclear industry should not have its head in the sand either. In fact, the terms of the loan guarantee program for nuclear projects (in the form of large up-front fees) has caused some to reject the option anyway. If the nuclear renaissance is to continue in the United States, it is not too soon to begin to consider other options. It has occurred to me that I have reached a bit of a hiatus in blogging about the Fukushima accident and its aftermath. No doubt there will be more issues that arise in the future that will get my attention again, but for now, I thought it might be convenient to list the dozen and a half or so posts I have written in the first 6 months since the accident and to provide a very brief summary of each. The Japanese Government and Transparency: Another Issue for Nuclear Reactor Regulation August 30, 2011. This post looks at the different rules that govern Japan and the United States with respect to keeping records of meetings between regulators and licensees and making these records available to the public. Observations on Japan and its Nuclear Program: Not Anti-Japanese! August 18, 2011. In response to criticism from a friend that my posted seemed anti-Japanese, I tried to point out what I do admire about the Japanese, and to explain why it is important to note the features of the Japanese system that may have contributed to how the Fukushima events unfolded. Japanese Regulation: The Elements of Independence August 11, 2011. In this blog, I recognize that, as Japan strives to create a more independent regulator, they need to be aware that there are really several different types of independence that are important in nuclear regulation. Suggested Changes to the Japanese Nuclear Program: Guidelines versus Requirements August 5, 2011. This blog reflects the fact that the Japanese can't just take the existing model of another country and adopt it whole cloth. A new regulatory authority will have to operate within the Japanese system, and therefore any model used must be adapted to work in that system. Nuclear Regulatory Independence in Japan: The Role of Technical Capability July 24, 2011. In this post, I note that the Japanese government tends to be staffed primarily with generalists, and that it would be desirable to try to increase the number of technical specialists in the Japanese regulatory agency. Fukushima and Coverups: Eraser Society July 22, 2011. When I lived in Japan, on several occasions, I saw people erasing or whiting out minor errors and I realized that it was an attempt to hide a mistake. I speculate that some of the reports we saw coming from the Fukushima accident may have represented a similar attempt to hide mistakes. Considering the Fukushima Accident: Does Culture Matter? July 18, 2011. One famous homily that children learn in Japan is that "the nail that sticks up gets hammered down." I raise a question about whether some engineers in Japan didn't stand up to authority when they should have because they were so carefully taught not to "stick out." Post-Fukushima Findings: The Origins of the Problem begin to Emerge July 15, 2011. This post reports on news items about how some of the original construction decisions made for Fukushima Dai-ichi may have exacerbated the effects of the tsunami. Nuclear Regulation: Finding the Right Balance June 17, 2011. While this blog was not explicityly about Fukushima, it was probably spurred by all the thinking I was doing about Fukushima at the time. It reflects on how difficult it is for the regulator to find the right balance between too little regulation and too much regulation. Replacing Nuclear Power: And Other Fantasies June 11, 2011. Although this post was about whether or not nuclear power could be replaced, it was spurred by the post-Fukushima demands by citizens in some countries that seem to suggest the citizenry thinks that it will be simple and quick to replace nuclear power with other sources of energy. 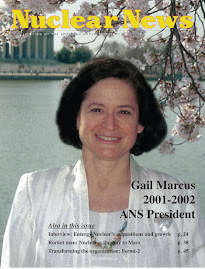 Nuclear Revival: A Scientific American View May 29, 2011. This blog mainly covers an article published by Scientific American prior to Fukushima, but also discusses a post-Fukushima editorial in the publication that proposes that reactor designs and regulatory processes should be improved in the wake of Fukushima. Japanese Nuclear Regulation: A Call for Change May 13, 2011. I was pleased to see that some of my colleagues in Japan who are active in the Atomic Energy Society of Japan (AESJ) were the first to propose that the Japanese regulatory system needed fixing, and I summarized their first announcements on the issue. Fukushima and Amakudari: A Problem with a Long History May 6, 2011. In this blog, I discuss the fact that Japan has a system called amakudari, whereby government employees often move into positions in the industries they control. This system makes it very difficult to maintain the regulatory independence that is required for nuclear power. Post-Fukushima: Some New Directions? April 23, 2011. This post provides a summary of two of the early discussions of some of the specific changes that the United States might want to make to reflect the lessons learned from Fukushima. Positive Views on Nuclear Power: A Small Bright Light in a Difficult Time April 14, 2011. In the early days after Fukushima, I was pleased to see that the coverage of the accident was, in many places, more positive than I thought it might be, and this blog lists several articles that had appeared in the first few weeks after the accident. Fukushima: The Devil is in the Details March 27, 2011. In the first days and weeks after the accident, there was much concern about US reactors of similar design and vintage. Thus, I was happy to report on an article that identified some differences between the Fukushima reactors and the ones at TVA. The Fukushima Nuclear Accident: Some Observations March 19, 2011. This was my first post about the Fukushima accident, and it covers my earliest observations. Also: Nuclear Regulation in Japan after Fukushima August 2011, in the JANUS "Toward Post-Fukushima" Series (now renamed "Fukushima Reconstruction Support" and on a new website). This blog was written for Japan NUS (JANUS) for a series of essays from various experts around the world on different aspects of the accident and what it might mean in the future. I was pleased and proud to be asked to contribute to this series and used the essay to summarize my thoughts on nuclear regulation. Other essays in the series provide the insights of experts from around the globe. On September 19, 2011, the DOE Energy Information Administration (EIA) rolled out its latest International Energy Outlook, IEO 2011 at a briefing presented by the deputy director and acting director of EIA, Dr. Harold Gruenspecht, at the Center for Strategic and International Studies (CSIS) in Washington, DC. The report makes projections about the global supply and demand of different energy resources between now and 2035. I attended the event, so heard the overview of the report as well as the Q&A session that followed. I will not try to summarize the whole report, as much of it deals with oil and gas, and in any event, is available on the EIA website, as is a video of the presentation. However, I thought I could augment the report by making a couple of general observations about the IEOs in general, and also by highlighting a couple of comments Dr. Gruenspecht made that are not in the report itself. I first want to recognize that the nuclear community has a long-standing ambivalence with past versions of this report. Over the years, many have complained that it is too pessimistic about the prospects for nuclear power. Indeed, when I worked at DOE, the projections of the Office of Nuclear Energy, where I worked, and the projections of EIA, which is an independent arm of the DOE, often differed significantly. One fundamental reason for these differences is that the EIA makes its predictions based on existing policies and programs. In that sense, while their projection is not literally a straight-line projection, it has some of the characteristics of a straight-line projection. The projection does recognize population impacts and price impacts, but it doesn't assume that policies will change or that long-range plans will necessarily materialize, so it ends up off the mark when some of these plans actually come to pass. On the other hand, the Office of Nuclear Energy, the industry, and others often include anticipated policy changes and long-range plans in their projections, so their projections end up overestimating nuclear power growth when some of these plans and policies do not materialize. Leaving aside the philosophical discussion about what anticipated changes one should or should not include when making projections, I found this year's report, and the discussion at the briefing, particularly interesting from a nuclear perspective. In particular, the report has been a year in the making, and some of the information in it is already dated. The report shows the penetration of nuclear power increasing from 5% to 7% of total energy demand globally by 2035. However, Dr. Gruenspecht pointed out that the nuclear portion of the report was developed prior to the Fukushima event, and was not adjusted to reflect the decisions several countries have made following that event. Dr. Gruenspecht did not attempt to quantify what he thought this effect might be, but he mentioned several countries whose changed nuclear stance would likely affect the projection. The countries he named were Germany, Japan, Italy, Switzerland, and China. Now, I'm not disagreeing that the projected percentage is down--IAEA is making similar predictions (in terms of percent of global electricity demand). However, I found his list of countries a little puzzling. These countries have all announced very different decisions, and I would think their impacts on the 2035 IEO projection would range from significant to almost no change. In the case of Germany, the change does indeed seem pretty clear. Japan is also certainly on a downward trend for the near future. In the case of Italy, Italy was only at the very beginning of their nuclear "revival" when Fukushima occurred, and since EIA doesn't factor in "plans" lightly, I have to wonder if Italy was even considered in arriving at the 2035 estimate, and therefore, if the Italian decision will affect the projection at all. Switzerland has already modified its initial statements, and I'm not sure that what it is saying now will lead to a significant change in the IEO projection. China has reportedly scaled back its new reactor plans somewhat, but many (myself included) always doubted whether their stated plans could be realized, so I seriously doubt whether the IEO projection for 2035 was based on the original Chinese plans anyway. It will be useful to see a realistic projection, by country, taking into account 1) how optimistic or pessimistic the previous estimates were in the first place, and 2) seeing how the recent announcements by different countries have been factored in. In that regard, however, the future of the IEO is unclear. Dr. Gruenspecht alluded to budget constraints possibly limiting EIA's ability to produce this report in the future. While some in the nuclear community will not mourn its loss, it has proved to be a useful report for many purposes. It does pull together a lot of useful information on resource estimates, price trends, population changes, and other factors. With the IAEA General Conference going on in Vienna this week, we are hearing a lot about the effects of Fukushima, both on current nuclear power operations and on the future of nuclear power. Given all the uncertainties in the aftermath of that event, it was very encouraging to hear the Director General of the IAEA, Yukiya Amano, predict that there is still likely to be significant growth in the number of operating nuclear power plants in the future. Amano's prediction was that IAEA expected between 90 and 350 new units by 2030. The higher prediction would represent nearly a doubling of the current number of reactors operating worldwide. Now, I must confess I am very leery of predictions. If I were speaking to Mr. Amano, I would advise him of the statement of America's most famous philosopher, Yogi Berra, who said, "It is difficult to make predictions, especially about the future." The same news items that reported IAEA's predictions also reported that they are lower than projections IAEA had made prior to the March 11 events. Nevertheless, the reasons Amano cites for the continued growth of nuclear power--increasing demand around the world for clean energy--are solid, and the early signs are certainly clear that the countries with the largest nuclear power development programs are continuing to pursue nuclear power. Therefore, IAEA's prediction is based on strong evidence. While I probably wouldn't hazard a quantitative guess, I do think the signs point toward continued nuclear power development in a number of nations. Then again, IAEA has information on national plans that I don't have, so they are in a better position to place a number on their projections! 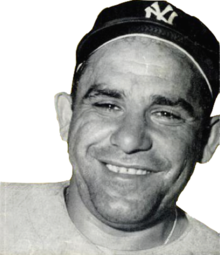 Yogi Berra still has a point, of course. Just as Fukushima changed IAEA's earlier projections, another serious incident could cut into the current prediction. But short of that, I think the nuclear renaissance that everyone was predicting a few years ago has been slowed, but not derailed. With this blogpost, I take a little break from the weighty issues of the day. A trip to my local Post Office the other day brought me face to face with the USPS's latest stamp offerings focusing on "pioneers of American industrial design." The set features, as one might guess, designers of things like telephones and typewriters and table lamps and clocks and radios and cameras. But there among them was one that especially resonated with me. A picture of two Fiestaware pitchers, one in a familiar brilliant orange-red glaze. A glaze made possible by the use of uranium. Yes, uranium. Long, long ago, boys and girls, in the days before nuclear reactors, uranium was a by-product of mining for silver and other minerals. Enterprising people of the day, looking for uses for this material, found it did wondrous things in pottery and glassware. The orange-red glaze used a uranium oxide and was a signature feature of the Fiestaware product line starting in the 1930s. So much so that when the US government commandeered all supplies of uranium as part of its effort to develop the bomb, the company went into decline. 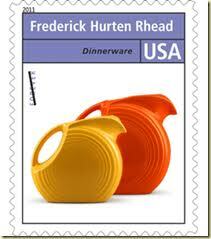 Actually, Fiestaware was not the first product to use uranium. Glass containing uranium oxide has been found in archeological sites dating from Roman times. More recently, so-called uranium glass (also sometimes called Vaseline glass because of its yellow-green color) was popular from the late 1800s to the early 1900s. Uranium glass has an interesting property that makes for a fun parlor trick. When exposed to ultraviolet light, it fluoresces. Of course, that characteristic is a consequence of the electrons, not the nucleus, but it is fun to demonstrate just the same. I probably first became aware of Fiestaware when I attended the opening session of an ANS meeting over 20 years ago. With all due respect to the many distinguished people who have made presentations at the opening plenaries of ANS meetings over the years, the one I most enjoyed was by James Acord, an artist who gave a highly entertaining presentation about his desire to use Fiestaware in his sculptures, and his long battle with the NRC to obtain a license (yes, really!) to possess the uranium in the large quantities of Fiestaware he was acquiring. I am pleased to report that he was ultimately successful in that endeavor. I am less happy to report that, in the course of looking up some things for this blogpost, I learned that he died this past January. I'm not an avid antique collector, but after hearing his presentation, I started to keep an eye out for pieces of original Fiestaware in the characteristic color. (Fiestaware is in production again, but doesn't use uranium glaze.) I more recently branched out and acquired a piece of uranium glass. I figure it is only fitting to use a piece or two when I entertain guests. It's been interesting to watch people's reactions. One woman who has a good technical education surprised me by visibly backing away from a Fiestaware platter on the table. Most people, however, are just curious. Since the colors and the fluorescence are more in the realm of chemistry than nuclear science, even nuclear engineers are perplexed by why the color of the glaze is orange-red and the color of the glass is yellow-green, and why the glass fluoresces but the glaze does not. Now admittedly, the Post Office series was not meant to honor Fiestaware per se, but rather to honor the man who designed the Fiestaware line (Frederick Hurten Rhead). Nevertheless, I thought the fact that one of 12 stamps on American industrial design features an early use of uranium was significant. So, although the Post Office's stamps would not ordinarily be a subject for one of my blogposts, I felt I could take a late summer break from the more serious stuff and write about Fiestaware and uranium glass.